The lighthouse of Cabo de Palos is one of the most iconic features of the village. It was declared a tourist attraction due to its neo-classical design and rich history. Cabo de Palos village is a small cape that extends into the Mediterranean Sea. The cape was formed as a result of volcanic eruptions that form a vast landscape that is suitable for diving. Cabo de Palos is known as the best diving site in Europe. The peninsula also features an enclosed area called the Islas Hormigas reserve that is extremely dangerous for ships to navigate through as rock formations rise three meters above the ground. It was this hazard that resulted in the need to build a lighthouse. The original plan was to construct the tower on the reserve, but the plans changed due to the difficulty of carrying the building materials to the islands. Initially, a Ba’al temple had been set up on the site during the reign of the Carthaginians. Later (1556-98), Felipe 11 ordered the construction of a watch-tower to warn the locals when Berber raiders from North Africa attacked. The tower was destroyed in 1861 to pave the way for the development of the lighthouse, which was completed in 1864. However, the first lamp was installed in 1865. It used olive oil, but the Scot introduced petroleum and paraffin later. A two-storey building has been constructed at the base of the main tower. It was designed as a school for lighthouse keepers but was later transformed into a home for families that maintain the lighthouse. 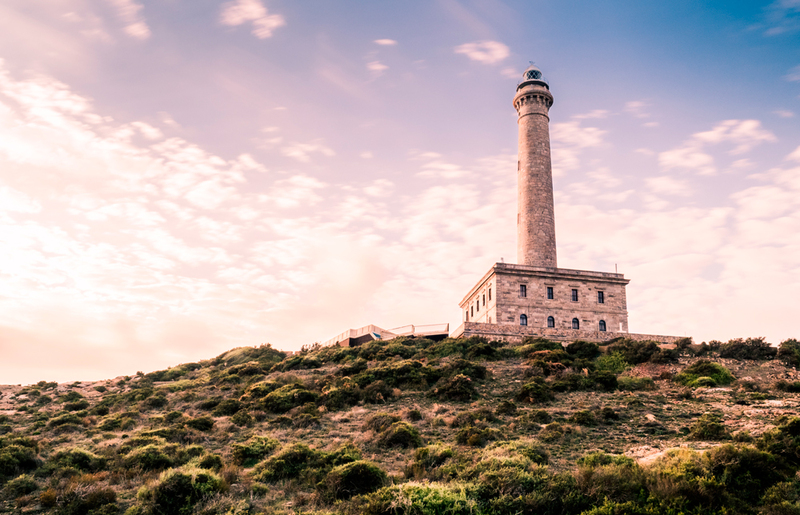 Today, Cabo de Palos Lighthouse is a popular tourist attraction. Visitors stream here to enjoy the beautiful view of the rocks and drive, walk or bike atop the peninsula. Traditionally, the festival was held every year in August at the lighthouse, but today it is held at the church in the Cabo de Palos village. Tourists get to enjoy choral music performed by the local choirs from various regions. The beaches are located near the lighthouse and have adequate driving access and parking space. Cala Fria beaches are used as dive schools as the bay here is pretty shallow and sandy. It is an excellent place to stroll, sit and watch the sunset and the local fishermen alighting at the shores. The marina still works as a fishing port, and you can enjoy delicious sea dishes offered in the neighbouring restaurants.